There aren’t many game mechanics as frustrating as weapon degradation. Getting attached to a certain tool of destruction, spending time and resources making it that perfect implementation of your destructive will, only to have it snap in half on the brow of a low-level mob is pretty infuriating. The Weaponographist takes that mechanic and makes it a core component of the game’s design – every weapon you use will eventually, often quickly, break. A risky move, but one that creates a refreshing take on the roguelike genre. Keeping your combo meter going is key to getting better equipment and rewards. As Doug McGraves, the vacuous heap of muscle, armor and hair, your hubris has led you to being cursed by a witch. Save her town from invading monsters, or be doomed to break everything you touch and lose your strength forever. Delving through the many levels of the town to defeat baddie after baddie is standard roguelike procedure, as you make a little more progress each time but get sent to the start after every death. Ladders and warps open up to help you get back to forward progression in a more timely manner, but expect a lot of retreading old ground and defeating the same enemies repeatedly. The enemies and locales have great variety, and keep things fresh through long sessions. The fun is in learning to turn those enemies’ weapons on them. Each new mob means a new tool to pick up from their corpse, and these can range from swords and spears to machine guns and tubas. The variety is really engaging, and switching from weapon to weapon feels fluid and fun – mastery is gradually rewarded as you progress further in The Weaponographist. Besides just weapons to swing, you’ll also pick up magic spells that have a variety of effects, though I always found myself adoring the trusty fire barrier more than anything. There’s a lot to use in your arsenal, and the constant pick-up-and-swing mentality of combat keeps things fresh. You won’t have many chances to become complacent with a single weapon type, you’ll have to use them all, which can be frustrating when you’re stuck with weapons that don’t fit your playstyle but exciting when you pick up that third machine gun in a row. A lot of combat is keeping just enough distance to poke at them without getting hit. Mastery of weapons is also how you’ll make that progress, as you need to keep your combo meter up to earn better rewards. Killing enemies quickly in succession, while switching between weapons, means more resources to spend at the town hub on upgrading your “loadout.” While you have little in the way of persistent gear, you can still upgrade your proficiency with weapons, increasing its damage. While the combat is interesting and likely to hold your attention, the aesthetic is a mixed bag. It’s certainly a vibrant and different style of game than most roguelikes, but The Weaponographist also does little to inspire overly memorable locales or characters. Even bosses, entertaining as the fights may be, aren’t much to write home about compared to other titles. Circus performers, giant robots and evil trees all look vibrant and colorful, but the running theme of the game barely keeps it all together in a thematic sense. The controls feel lose and floaty, almost like everyone is skating on ice rather than running around. It creates a routine where you start a swing and then run into an enemy with it, a weird wind-up that doesn’t feel as tight as it should. It isn’t broken and you certainly won’t die from it, but a little tighter on the controls and less “ice skating” would help the combat feel more tight and reactive, rather than a jousting match at the local rink. Some of the weapons can get pretty strange, but also pretty fun to adapt to and use. The repetition can get a bit numbing too, and long stretches of playtime start to run together more than in other games. The Weaponographist is much better in short spurts than long play sessions, as the longer you play, the more dull it will feel to kill the same spear-wielding goblin for the umpteenth time on your way to the next new area. The game also tends to err on the short-and-sweet side, a solid ten or less hours to get the full package of the game. 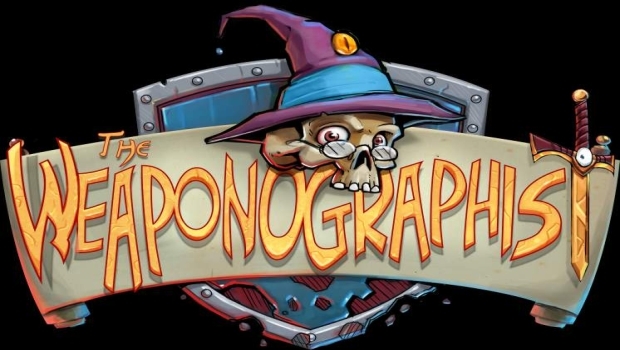 As a short title, The Weaponographist is a fun distraction for those looking for something fresh. By taking a risky concept and making it a core gameplay mechanic, Puuba has set itself apart from the sea of roguelike copies, though it won’t be taking the rotating spot of the genre staples. It’s fun, fast, and engages you with interesting mechanics, and will certainly take up a decent amount of your time for a while. Fresh and engaging, The Weaponographist is a succinct package of roguelike goodness. If you need a quick fix of something new for a weekend, this weapon-breaking dungeon-delver will suit that need perfectly.